I recently wrote an article about where to buy a $300,000 home in Tallahassee, and I received a request to provide a similar report in the next higher price range, what we will refer to as "Executive Homes" In Tallahassee. Due to the lack of liquidity in the Tallahassee housing market for homes priced above $300,000, our price range tracking expands greatly. 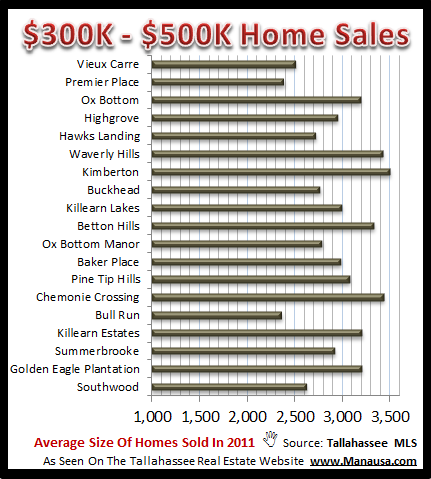 Today, we will look at neighborhoods in Tallahassee where homes have sold in 2011 for $300,000 to $500,000. First of all, you could start by searching the Tallahassee MLS to see how many executive homes in Tallahassee are listed for sale. Currently, there are 235 homes for sale in Tallahassee between $300K and $500K, which represents about 1 year’s supply of inventory. This means that if nobody puts another executive home on the market for the next year, and nobody lowers their asking price to the executive home price range in the next year, then we already have enough inventory to satisfy the current rate of demand for another year. Simply put, that is way too much inventory of executive homes in Tallahassee and thus homebuyers have a great opportunity to find a super deal. 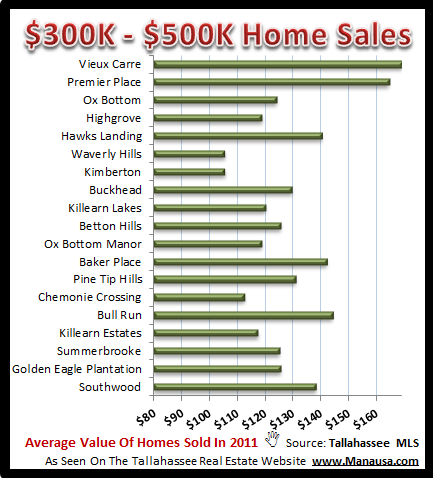 One thing to remember when we look at homes that have sold from $300,000 to $500,000 is that all of these homes had dropped over $100,000 in value since the height of the Tallahassee housing market. That is not a small number for anybody in Tallahassee. 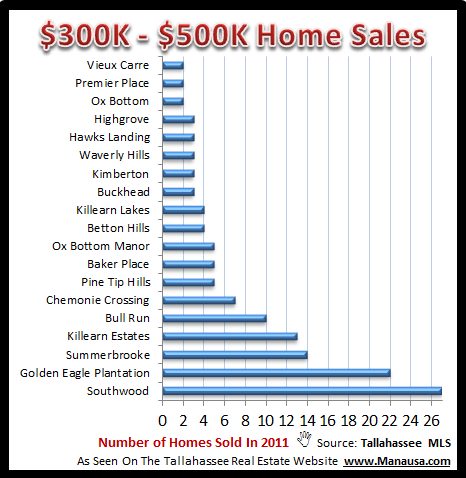 The real estate graph above shows that Southwood and Golden Eagle Plantation have recorded the most sales of executive homes in Tallahassee thus far in 2011, though 22 Tallahassee neighborhoods recorded 2 or more of these types of home sales. So, just how big are these executive homes in Tallahassee? The real estate graph below show that they run from 2,300 to 3,500 square feet. If we look at the price per square foot of executive homes in Tallahassee, two neighborhoods stands out as the best bang for the buck. Waverly Hills and Kimberton deliver the largest house for the dollar, though the age of the homes are older than the other neighborhoods.